highly developed musical abilities: the oldest brother, Roger, for his songwriting and very creative guitar playing for Mission of Burma; the younger and right-handed twin brother, Ben, for his compositions and saxophone playing for Destroy All Monsters and his own Sensorium Saxophone Orchestra; and the younger and left-handed twin brother, Laurence, for his guitar playing for Destroy All Monsters and The Mister Laurence Experience. Laurence played together in Destroy All Monsters in the late 1970s; the twins also played together in Xanadu immediately after they left the Monsters, and then again in various bands that were active in Ann Arbor in the early 1980s (the Same Band, the Other Band, God Knows Who, Radio Silence and Nonfiction); and Ben has performed onstage with Mission with Burma. And all three have played and recorded together as M3, which produced an excellent collection of hard-rocking, “industrial”- flavored improvised songs (Unearthing) in 2001.
together in a group called Sproton Layer. 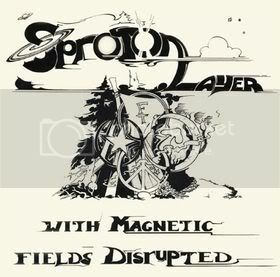 Before breaking up in 1971, Sproton Layer recorded a full-length album, With Magnetic Fields Disrupted, which wasn't released until 1992, along with a three-song single, Lost Behind Words. These were remarkable recordings, not just for the age of the musicians (only teenagers! ), but also because they played all-original songs (mostly written by Roger) that didn’t really sound like any of the songwriters who had inspired them (Syd Barrett of Pink Floyd, Robert Wyatt of Soft Machine, and Captain Beefheart, among others). Furthermore, Sproton Layer played “psychedelic rock” at a time when that genre was somewhat passé. At least in Ann Arbor, “psychedelic rock” had been replaced by the hard rock and proto-punk of the MC5 and the Stooges. Smith replacing Harold Kirchen on trumpet) decided to reform Sproton Layer. In June/July 2013, the band played a half-dozen shows in Ann Arbor, Detroit, New York City, and Boston. It was my pleasure to see Sproton Layer – a kind of supergroup – at the Mercury Lounge in New York City on 26 July 2013. The three Miller brothers played instruments with which I normally do not associate them, though these were the same instruments they played back in 1969-1970: Roger played bass; Ben played guitar; and Laurence played drums. Not surprisingly, Roger turned out to be an excellent bass player, and Ben to be an excellent guitarist. The real surprise and great pleasure was Laurence, who turned out to be an excellent drummer (who knew?) with a distinctive, very “muscular” style. (“Secret,” “Strange Lands” and “Forest”), for a total of 15 songs. Steve Smith played on six of them, and did a fine job of adding an interesting texture to the power trio’s sound, but without detracting any attention away from it. My favorite by far was the hard-rocking instrumental “Space Red,” which originally appeared on Lost Behind Words. material. It is sure to be a winner. One of four published stories in June, during their Ann Arbor/Detroit Metro 43 Year Reunion Concerts. Ironically, a group of Tom's former Pioneer students who took his Creative Thinking Class back in the 1960's, are scheduled to play in a reunion of their high school band, SPROTON LAYER. Just a few weeks too late -- Tom would have loved to be there. The Miller Brothers were the heart of the band, along with then-trumpet-player Harold Kirchen. And when Pioneer suffered it's mysterious Clock Shortage of 1969, Tom knew just who to turn to: At Tom's request, Harold and Roger were happy to arrange for a fully functional, original-equipment, but psychedeclially-enhanced IBM clock to mysteriously appear on Tom's classroom wall. Kirchen reportedly hung up his horn years ago, but Mission of Burma's Steve Smith is more than capable, and will be there on Friday, playing trumpet in his place. Many of Tom Dodd's former students will be there at The Blind Pig on Friday as well, and the celebration of Tom's life will inevitably continue along with more planning for the re-release of one student's Creative Thinking class project, a movie which Roger composed the soundtrack for and all three brothers recorded way back then. It's truly a small world with only one or two degrees of separation around here this week. See you at The Pig? Most rock records from the 1960s that were written and performed by teenagers are achingly rooted in the heart and loins, generating songs of love and lust. This document of a teenaged band in a mid-American university town is cerebral, motivated by music, art, lore and existential questioning, not (at least primarily) by a craving for the affections of girls. Or if their eyes were on the girls, its musical messages are veiled, literary and artsy, addressed to the more refined and aesthetic young women of their university-town circle. Sproton Layer's singer and bassist Roger Miller was 18 when With Magnetic Fields Disrupted was recorded in the summer of 1970, and his younger brothers on guitar and drums, twins Ben and Larry, were 16. The three were sons of an icthyologist teaching at the University of Michigan and lived on the northwest side of Ann Arbor within walking or biking distance of the campus. The other member of the band was trumpeter Harold Kirchen, son of an automotive engineer. At the time, Kirchen's brother Bill was playing exemplary country/rockabilly guitar with Commander Cody and the Lost Planet Airmen, the band formed and sometimes residing in Ann Arbor. I believe I heard Sproton Layer, several months after this recording at our shared high school's springtime Creative Arts Festival. Instrumental skill, interesting time signatures, and arresting stop-time have always characterized all three Miller brothers' work. What strikes this listener 40 years later is how skillful this band was, assured, and confident within its genre, time, and active rock musical scene. The album's opening track, "Gift", is fey and childish, the singer demanding attention to a picture he made; "It's red, and black, and blue, in pencil". Chords descend the scale like in Pink Floyd's "Astronomy Domine," and it has the doe-eyed childishness of that band's co-founder Syd Barrett, evincing Barrett's profound influence upon the conscious English dandyism of Midwestern American psychedelic youth. Michigan boys generally don't say (or sing) things like "I really think that it's quite nice to look at" after about age 7. Kirchen trumpets with simple clarity, a medieval herald announcing guests to the castle. The song easily segues into "Pretty Pictures, Now", its head-nodding beat insistent as the "One of us! One of us!" banquet chant in Todd Browning's "Freaks". It has characteristics of psychedelic rock from San Francisco's Haight-Ashbury or "Piper at the Gates of Dawn"–era Pink Floyd, from the bass solo by Roger and his ensuing interplay with Ben's guitar, to Larry Miller's drum rolls. "In the Sun" has the propulsion of Pink Floyd's "Pow R. Toch", while Ben's guitar alludes to another bravura Michigan guitarist I never would have previously noted as influencing these Millers, Ted Nugent. In the 1970s Nugent descended into macho self-parody, where he remains further freighted with right wing political editorializing but was a technically impressive player with his 1960s Detroit band The Amboy Dukes. The structure and lyrical melancholy of the next two songs reminds one of the skillful Michigan band SRC, whose "Travelers Tale" album appeared about this time. "Sister Regis" features a notable trumpet solo by Harold Kirchen and Tolkeinesque lyrics, and the moody "Bush" makes use of Kirchen's horn too, where there is a sweet tone like Herb Alpert, with occasional Tijuana Brass mariachi flourishes. This reviewer remembers a party 40 years ago where Kirchen showed up in an over-the-head gorilla mask, which he also wore in the Ozone Parade, a goofy parody of the University of Michigan's annual Homecoming Parade. "Tidal Wave" begins with an atonal guitar crunch prefiguring Punk around 1980, the era Roger was having success with his Boston-based band Mission of Burma. Larry's drums are energetic and precise. "Up" could have been performed by the White Panther Party-affiliated Ann Arbor band of that name, or the MC5. Kirchen's horn, however, suggests something from the Bonzo Dog Band's "Urban Spaceman" album. "The Blessing of the Dawn Source" begins pompously, then sails instrumentally into a clutch of lyrics rhyming "distance" and "resistance", "glimmer" and "shimmer." It then swings back and forth a bit monotonously, evoking Spinal Tap, until Kirchen––an interesting foil for these consummate rockers––comes in with regal horn fanfare at the end. "Nocturnal Mission" is a quirky two chord siren of spy-movie guitar and bass, beneath somewhat sophomoric (hey, half of 'em were sophomores!) stoner poetry, but that's OK, for it keeps up the momentum, with Larry's furious drumming and crash cymbal, that Ann Arbor boys had grown to expect from older bands jamming at the free Sunday afternoon rock concerts all summer long. One digs beneath the Sproton Layer's youthful flowering for seeds of these guys' later work. The insistent, jagged edginess in this band certainly resurfaced in Roger's Mission of Burma, his solo piano album and subsequent tenure in Birdsongs of the Mesozoic. Ben has continued exploratory guitar projects in New York City, including a guitar orchestra and collaboration with Glenn Branca. The very title of one song here, "Pount of View," exemplifies an obstinate punning, whimsical as Lewis Carroll or Edward Lear, in Larry's mid-'70s EMPOOL zine, or his '90s band Larynx Zillions. "New Air" (later the name of Roger's acoustic band with Leslie Orlin and Larry Wahl) is one of those characteristically circa-1970 prog-rock pieces whose alternating slow and rocking parts demand focused attention, like the MC5's "Star Ship," which, in the latter case, usually resulted in audience members leaving the ballroom for a while. Sproton Layer's final track here, "The Wonderful Rise," ends up with an oom-pah waltz beat not inappropriate for Ann Arbor, much of whose population descended from 19th century German settlers with names like Miller and Kirchen, or Schlenker, Kemf, Allmendinger and Fritz. Four years later the Miller twins' high school classmate Jim Rees and some fellow residents of Joint House Co-op (at one time, home of Sun Microsystems co-founder Bill Joy) obtained some brass instruments and antique horn charts to launch a German-style parade band. Eschewing his teenage maturity and seriousness, Sproton Layer's cheery tootling also prefigures some of Larry's children's music of the past decade, performed––and frequently uploaded to YouTube––under the name Mister Laurence. One wonders how the Teutonic turn in "The Wonderful Rise" is perceived by the German CD label responsible for this reissue. The CD comes with a fun, illustrated booklet, with much information on when and where the lads wrote their songs and smoked their dope, assembled by Stan Rebo in 1991, plus a memoir by the recording's original producer Mark Brahce. It is illustrated with minuscule reprints of the Millers' hand-penned lyric sheets and drawings on school notebook paper. Not long after this recording, Gertrude Prokasch Kurath, a local folklorist and leader of children's folk dances, commissioned publication of Roger's songbook and deposited a copy in the Ann Arbor Public Library. We are fortunate to have such documentary magic mushrooms of bohemian Michigan youth four decades ago as Sproton Layer's With Magnetic Fields Disrupted now available to us all. A lost classic from the 1970’s get a sprucing up here on this re-issue. From the wilds of Michigan came this band that featured three brothers-Roger, Ben and Larry Miller. Roger would go on to front Mission of Burma. But from 1969-1970 this four piece blazed a wild sound that sounded like a space-age mix of Roky Erickson and Syd Barrett inviting a trumpet player (in this case-Harold Kirchen) to jam. There are 12 songs here and they will all expand your headspace-that’s guaranteed. Greg Ginn released this on New Alliance Records in 1991. But since he doesn’t believe in updating his back catalog, this German label raised the flag. The remastered sound is punchy and intense. Plus there is a booklet packed with updated information on the band. Get this; let it sink in to your bloodstream. Then look for a “new” release from this band in 2012. This review is far too in depth (lengthy) to post here. This is one of those gems I find that wasn't truly released until years after it was recorded. Sproton Layer was a group of Ann Arbor teens (all between 15 and 17 when the project started in '68) deeply under the influence of Barrett-era Pink Floyd, free jazz, Beefheart, the Stooges, etc. Why should you care? Well, it just so happens that the brothers Miller comprised 3/4 of this group. Bassist/lead vocalist Roger went on to Mission Of Burma et al eight years later (after relocating to Boston), while drummer Larry and guitarist/vocalist Ben joined Destroy All Monsters for the seminal "Bored" single. The brothers had previously performed together as Freak Trio, which was apparently a mostly improvisational project. The remaining Sproton member was trumpeter Harold Kirchen, who brought an unusual yet completely wonderful touch to the band. As for the music itself, these guys put some "professional" groups to shame! Having performed live several times in the previous two years, Sproton Layer recorded this album in 1970. Simultaneously ahead of their time yet perfectly suited to it, Sproton Layer created songs that can be noisy and heavy or pretty and dreamy, often within the same short composition. Larry's unusual jazz-influenced drumming combines perfectly with Roger's chugging bass, while Ben has absolutely no problem either following along or going off on noisy tangents; he even delves into proto-noise rock and surf modes at times. Secret weapon Harold punctuates all the right moments with expert trumpeting, and while his presence is a little startling at first, after a few listens you notice just how much that damn trumpet adds. To their credit, there's also not a drop of filler on this album*. The lyrics can be pretty goofy in a psychedelic way (sample: "I know where there's a bush!/O-VER THERRRRRRRE! "), but given the heavy Barrett influence that's perfectly understandable. A Barrett-influenced Mission Of Burma is probably the best description I can give this, but it really should be judged on its own merits as a remarkable recording by a young band who never got their due. While this IS out of print, you should be able to get a good used copy for less than $5 (I did!). This was the last thing Sproton Layer ever did; New Alliance released a three-song single at the same time that shows off their improvisational side on a track or two, and this is also worth hearing. Once you hear Sproton Layer, you'll be glad ANYTHING by them survived to be issued at all! Music this good shouldn't go unheard; why is it out of print now?!?!?!?!?! It's probably worth noting that the Miller boys get together periodically as M3, so if you like this that should be your next stop. *Sadly, though, none of the songs on WITH MAGNETIC FIELDS DISRUPTED shows off their improvisational side all that much, but oh well, that's what the single's for. "...the overriding inspiration is undoubtedly early Pink Floyd... speed-induced Floydian space-outs highlight about half of these tracks, and are quite reasonable genre workouts."